I suffer from melody-idea-loss-aphobia: the common fear that a melody will be lost forever if not immediately recorded. That said, the FireStudio Mobile was an invaluable tool for writing vocals on my new record. In two snaps, I’d hook it up to my laptop and lay down vocal demos. Thanks to Studio One I was able to try out my ideas, mixing lead and back up vocals on top of rough instrumental tracks the boys had already recorded. 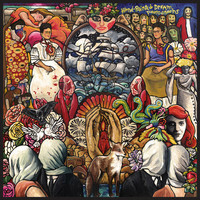 I wrote and recorded a four-part vocal harmony for “The Ship” on my own bed at 3 a.m. I exported each harmony individually, so that when it came time to officially record the seven-minute-long epic of a song, I could play them back individually and nail them in one take… almost. The tracks were also extremely helpful when it came time to perform; I had four choir singers on stage with me at our last Manship Theatre show, and they learned/practiced their parts with the demo harmonies! We’ve got a new album in the works, if you like what you hear in “The Ship,” why not throw in a little bit over at Kickstarter? You can pre-order the dreamy rock & roll album, or even have me cook a vegan dinner for you! Enter to Win a FREE Recording Package in the Flying Colors Gear Giveaway! 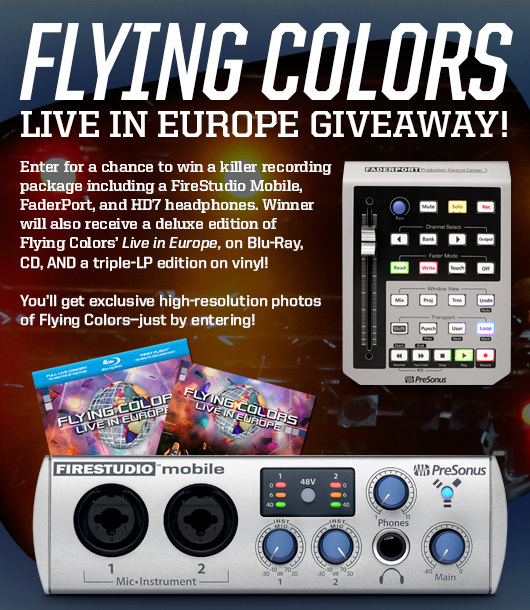 We’re celebrating the release of Flying Colors’ Live in Europe by giving away a killer prize package including a FireStudio Mobile, FaderPort, HD7 headphones, and a deluxe edition of Live in Europe that includes a Blu-Ray disc, double-CD album, and a triple-LP for you old-school vinyl lovers out there! To enter, just click on over to the following link, or click on “Flying Colors Gear Giveaway” under our cover graphic on Facebook! You’ll receive a great package of high-res photos of Flying Colors JUST FOR ENTERING! The band was launched in 2012 with a simple idea from executive producer Bill Evans: virtuoso musicians and a pop singer joining together to make new-fashioned music the old-fashioned way: by hand. Live In Europe captures the supergroup in Tilburg, NL. Formats are region-free Blu-ray and DVD, 2-CD, 3-LP Vinyl, iTunes HD (Mastered for iTunes) and Amazon MP3. Click here to check out Flying Colors on Facebook!